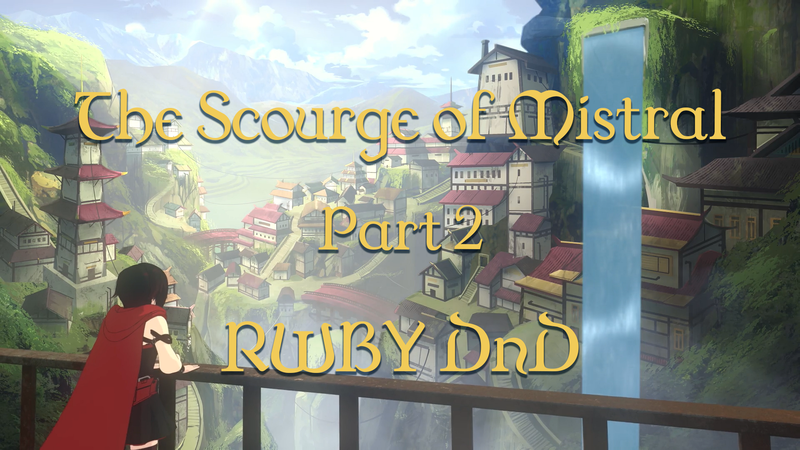 Andy Potter leads our heroes through their journey to save Mistral from a new threat in the second installment of our RWBY Dungeons & Dragons campaign, “The Scourge of Mistral”! In this installment our heroes venture to the town of Green Grove, nestled in the foothills of the Chungan mountain, and encounter a mysterious organization. Semblance: Draws power from the moon; when in direct moonlight becomes invisible and can focus his energy into manipulating dust particles. Lesser effect at night but not outside. Backstory: His parents killed by humans when he was young, Moon bounced around foster homes in Menagerie growing up. He always tries to be positive and look for the positives in people, even prejudiced humans although he harbors resentment for them underneath. Intimacy issues from his upbringing and focusing too much on completing his huntsman training caused a recent breakup with his boyfriend of a few years. Semblance: Can read body language, making her really really, annoyingly good at hand to hand combat. Because of her strict training regimen, she has built up a lot of stamina. Weapon: Twin daggers that can turn into pistols, linked by a whip/rope (think Blake) that lets her twirl them if she wants to fight from midrange. From: Vacuo but moved to Atlas and joined Atlas Academy after being recruited by Ironwood. Human or Faunus? : Bat-Faunus. She has fangs which make her human-passing, so she didn’t face much discrimination. Faunuses question her “identity” all the time. Personality: Cocky but polite. Takes orders well but not afraid to challenge them. Emotionally unavailable, but desperate for connection. Given her semblance, she can always tell when people lie, making her have deep-rooted trust issues. Socially awkward at times. Backstory: Kane has her mother’s eyes but looks like her father. Before she unlocked her semblance, Kane was actually a pretty outgoing, happy kid. But then, when a bandit tried to mug her and her parents in a dark alley, she unlocked her semblance, read his body language and told her parents he was lying. Unfortunately, she still couldn’t stop the guy from killing them. She tried to find the guy, but everyone, including the cops, was lying to her, covering something up. Her parents were well-known hunters and had a lot of enemies. She grew up with her grandfather, who tried to help her with her semblance. Ironwood recruited her after seeing her, still a scrawny kid, able to hold her own against his men. She had wanted to talk to him when she learned he was visiting Vacuo. He had publicly criticized the corruption in Vacuo, so she thought maybe he would know something. To gain her trust, he played a game with her: two truths and a lie. He said: 1) He didn’t know her parents. 2) He didn’t know who killed them. 3) He liked coffee with cream and sugar. His assistant then entered his office with a cup. Kane took it from them before Ironwood could reach for it, and tasted it. Black. Ironwood smiled at her grimace and asked Kane to come to Atlas. Kane agreed and thrived there, eventually graduating with plans to become a specialist for Ironwood. Instead, he suggested that she work as a huntress. It would allow her more freedom to do missions for him. And, given that it’s Atlas and pre-volume one of RWBY, faunuses weren’t allowed to be specialists. If she had joined the military, they would have hindered her career because she was a faunus. This was when she was finally forced to face that fact that faunuses would never be seen as “good enough” in the eyes of Atlas society. Not that she hadn’t faced zero discrimination. To this day, she refuses to use dust due to a certain company’s treatment of faunuses. She also still smiles at the memory of Jacques Schnee’s face crumpling in fury when he found out she had graduated top of her class. Looks: Long, light blonde hair that curls on the end, she wears it in a ponytail, hazel eyes, tall, military-grade muscles. NOTE: Beatriz’s performance of Kane will never match up to Kane’s true badassery. Personality: Mysterious, dramatic badass because of semblance. Flawed by being to independent and actually sad/self conscious because no one will ever see her but covers it up with drama. Background: Could never be close with people because of semblance and was shunned in school. Decided to go to Haven to become a huntress because no where else would have her. Met boyfriend, Coal, at Haven. He was blind but was like a bat with his semblance so good hunter. After graduating they travelled around Mistral fighting Grimm and once encountered a group of bandits. Opal and Coal fought them off and in the process stole a valuable object. Moved back to Mistral but then one day Coal was out doing his thing and encountered the leader of the bandits who killed him, looking for the object. Now Opal is on the warpath trying to recover from her lost love while also trying to find the person who killed him. Look: Because of semblance she is entirely covered.Black fabric mummy style wrapped face with goggles to see through, opalescent colour shifting long coat al la Blake’s, under that black tights and long sleeve top with boots, and some opaly necklaces (really matches her name rt style). Weapons hidden in the coat. Plus an ever changing collection of colourful patterned gloves which are easily removable to use semblance. Personality/Backstory: Since I was raised alone without much human contact on a broken down island, I’m kind of immune at this point to the sight of Grimm and post-apocalyptic scenarios. The thing that gives me fear is having to deal with social situations, but I’m learning to get along with my own species, even if I’ve come to terms with never really knowing who I came from. I’m beginning to attempt humor, although I believe humans are much harsher judges than Russ ever was to my dry quips. Bond: Russ, the Grimm I’ve known the longest on the island and the one that I’ve been able to tame to be my traveling companion. They provide warmth in the cold nights, and I help them fight off the occasional rogue Grimm that tries to take them on. Semblance: Air Manipulation; can create blasts/gusts of wind amplified by bracers/gauntlets, can jump super high, airbender-y stuff without being too OP… Can also do a shield charge using semblance, “a bullhead of air” when throwing shield at someone. Unlocked during secede from TWF @ age 16. Weapon: Purple bracers (twice Yang’s size) that deal concussive attacks close range. When she crosses her forearms (Wonder Woman ‘boosh’ style), excess metal from large bracers become a 8-pointed star-shaped shield (w/ smaller bracers); can be thrown (Captain America style) & be called back to either bracer, as well as call bracers to it pulling them magnetically (working on a recharge timer); can also be used as a normal shield. Personality: Chaotic/neutral dumbass; bull-headed (obviously), smarter than she gives herself credit for/pretends to be. Fights dirty & will do whatever it takes to win. “Hard no” = separating children from their families. Backstory: Parents were murdered by humans when she was 4, grew up a street rat in Minstral. Held back in Haven for bad/nonchalant attitude & repeated failure of class examinations. Was recruited into TWF at age 12 after being seen/caught thieving from a merchant’s food cart. Former terrorist of The White Fang; took part in targeting humans guilty of power, fame, & influence abuse,& exposing their secret crimes and bigotry. Staged public executions of them, until a particular targeted noble was found to be a single father of three faunus children. After the man’s death, Harm realized that, “we need to change the system from within, not by blowing it up,” and defected from TWF with hopes of joining a civil rights based group to represent the faunus. Look: Horns. Purple eyes. Bobbed red-brown curly hair. Scar across face from age 16. Knee-high brown boots, black leggings, grey turtleneck workout shirt accompanied with green pocket-vest jacket, no sleeves, large collar, hooded black layer underneath jacket, black Korra armbands. TWF tattoo (hidden) in the middle of her back, orange bandana wrapped around right bicep.